Frost Manor LEA Jesse Fraser is pictured here standing next to the home’s aquarium. Jesse recently started a program that engages residents in helping care for the aquarium’s fish. After Frost Manor lost the funding an anonymous donor had provided for the maintenance of the Lindsay, Ont. 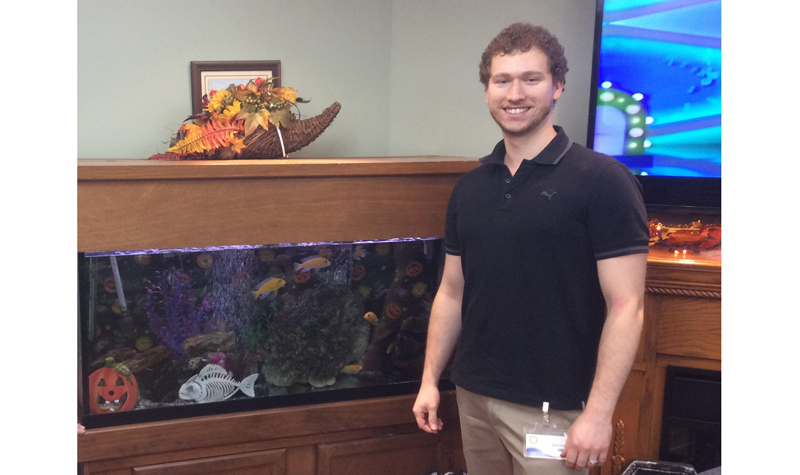 long-term care home’s fish tank for several years, life enrichment aide (LEA) Jesse Fraser came to the rescue. Life enrichment co-ordinator (LEC) Lyndsay Burton says Jesse saw an opportunity to put his vast knowledge of fish and fish tanks to work to help Frost Manor continue to have a thriving aquarium – and the residents are helping him with the new program he has created. As part of this program, residents help care for the fish and the tank, and they are learning new things. “With this new program, Jesse teaches the residents about the fish, their behaviour, breeding, their habits, how to clean the tank, and (he) even has the residents join in on adding fun-themed decorations for our scaly friends to enjoy,” Lyndsay tells The OMNIway. This program allows the residents to take more ownership of the fish tank and “they can really feel that they are a part of caring for the fish,” the LEC adds. Residents are taking pride in helping care for the fish In the aquarium, which sits at the front of Frost Manor’s lounge, Lyndsay notes. “They look forward to seeing the new babies hiding in the tank and seeing the décor change from season to season,” she says. Lyndsay adds that the initiative Jesse has shown with this program aligns with OMNI Health Care’s mission, vision and values. “This is a great example of how Jesse embraces the OMNIway,” she says.